Forget unruly in-laws or irritating habits, research shows one of the biggest causes of marital discord is Australians hiding personal debt from partners. One in six do not tell their other halves how much they're in the red, while 15% didn't disclose their personal debt until they were either engaged or married, according to financial comparison website RateCity. "Money causes a lot of conflict in relationships. It can be one of the hardest things to talk about," psychologist Victoria Kasunic said. 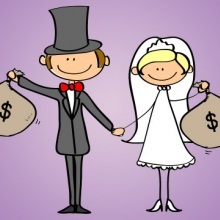 The problem comes from hiding the financial situation from one's husband or wife. I have seen this problem over many years as a church pastor. Let's be blunt – it is lying. The following scripture links financial well being and being open and telling the truth. O God, I beg two favors from you; let me have them before I die. First, help me never to tell a lie. Second, give me neither poverty nor riches! Give me just enough to satisfy my needs. For if I grow rich, I may deny you and say, "Who is the LORD?" And if I am too poor, I may steal and thus insult God's holy name. Stop lying to yourself and thinking that you can afford to buy whatever you see. Can you really afford to buy this or that? I know of people who continually lie to their wives or husbands about what they have bought. They lie about their financial position – 'My employer has not paid me what I earned – the money is coming!' – they claim they are owed money when in fact they will not receive anything. One of the biggest financial problems in Australia is gambling. This includes buying lottery tickets. People chase the quick buck by gambling and end up in greater debt. This is a scourge on marriages in Australia. Do not be part of this evil. Do not weary yourself to gain riches, cease from your consideration of it. When you set your eyes on it, it is gone. For wealth certainly makes itself wings, like an eagle that flies toward the heavens. Be honest with your wife or husband. Don't lie about your financial condition. Don't lie about what you have been spending. Don't deceive others about the state of your income or how much you have lost. Be honest with your children so that they know where you stand, then they will not expect to have the things that other children or teens may have. In a recent survey of children about what makes them happy, the acquisition of things did not rate. So you do not need to keep buying "things" for your children. Sit down together and talk honestly about your financial positions. Be honest. Work together. 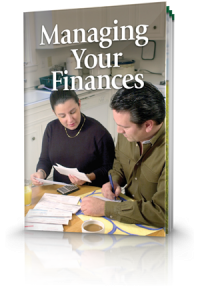 Find ways to improve your financial situation. Seek help from people who are good at home budgeting.This means working together, praying together, seeking help together, making a realistic budget together. The Greek word for "agree" is symphoneo, which means "to sound together" (from syn, "together," and phone, "a sound"), i.e., "to be in accord, primarily of musical instruments." Our word symphony comes from this Greek word and illustrates its meaning – to be in accord, or sound, together. When musical instruments of different tones and pitch play together in a symphony, they must sound together or symphonize to create a unified sound. And so it is with us – different wills and ideas must symphonize as one sound together. The application for us is to work together in unity and harmony. Better to be poor and honest than to be dishonest and a fool. What advice does the Bible offer about wealth and our attitude toward it? Is money really the root of all evil? Do you know what God thinks about bankruptcy? What does the Bible say about charitable contributions? How much should we give? Be sure to read this booklet to discover biblical answers to these important questions and more. Marriages in the 21st century are in crisis! Divorce is rampant and many no longer expect to have a life-long relationship. Can a potential couple know what true love is? Are there guidelines for a happy and productive marriage? 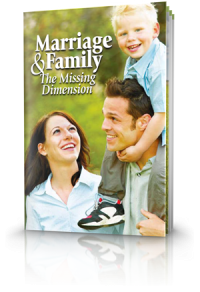 Our booklet on marriage and family contains biblically-based articles that will help you understand how to build a truly loving and life-long relationship. With the advancement of technology and social media, the family unit is disconnecting and fragmenting. 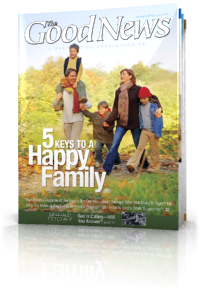 You can build or restore family closeness with five keys that can open rewarding doors to a happier family. Register free, cancel at any time. From a biblical standpoint, this is a very significant time of year. It reminds us of ancient Israel’s miraculous deliverance from Egyptian slavery, of the Passover commemoration, of the symbols Jesus Christ instituted as the ultimate Passover “Lamb of God” who gave His life for the sins of the whole world, and the fact that He is the “Firstborn from the dead” showing us how we, too, may receive eternal life in God’s family. 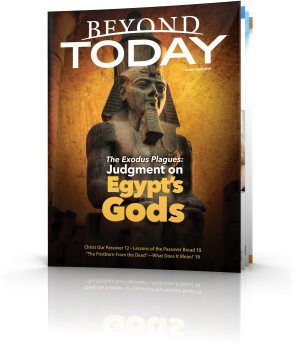 The articles in this issue cover these and other themes important to those who take the Bible seriously. We hope you’ll read them and take them seriously too! Download this issue in PDF or read online. © 2019 United Church of God Australia. All Rights Reserved. All correspondence and questions should be sent to . Send inquiries regarding the operation of this Web site to . 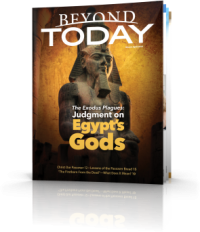 Beyond Today magazine is available to you at no cost whatsoever. Please provide your details below.